22mm wide rim takes tire up to 62mm. UST Road Tubeless technology improves comfort and rolling resistance, and reduces the risk of punctures. Compatible with all standard retention systems. High-quality QRM cartridge bearings. Disc-brake-specific, sleeved-style rim technology. Straight-pull round spokes, which are stronger than J-bend spokes. Sleeve joint rim minimizes weight. 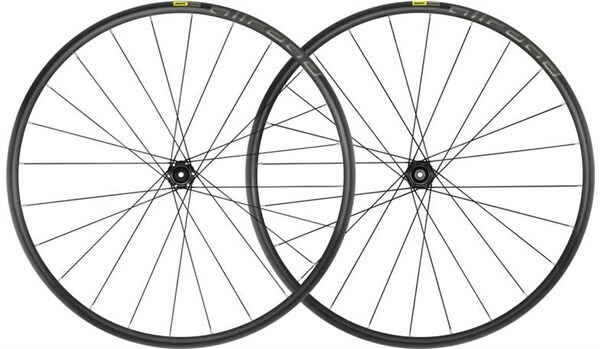 Consistent and stable spoke lacing. Low-friction hubs. With a wide 22mm rim profile that's optimized for high-volume tires, this UST Road Tubeless wheel system is built for adventure. Perfect for riding on rough roads, gravel or dirt, it gives you the smooth-riding performance of tubeless tires and makes it easy to set them up without any hassles. Low rolling resistance and a reduced risk of punctures add up to a better overall riding experience, especially on rugged terrain. The wheels are engineered for the unique demands of disc brakes, built up with 24 straight-pull spokes, which are stronger than J-bend spokes. So wherever the road goes, and however rough it gets, you're ready to keep things rolling.